I haven’t done that in a while, take part in the Self Portrait Challenge. This month’s challenge is the body. This brings me to another thing I hadn’t done in a while: take a long warm relaxing bath, complete with beeswax candle and ginger soap (birthday gifts). Giving my body a break, my mind too. Feeling the soothing touch of warm water on my skin, feeling less heavy (after a hearthy Easter weekend). the light reflecting on the water is calming and beautiful. i may need a soothing bath too. excellent photo! Nicely lit. It’s very warm and welcoming. That is an amazing photo. I absolutely LOVE the lighting and the condensation droplets reflecting it. VERY cool. Bravo. 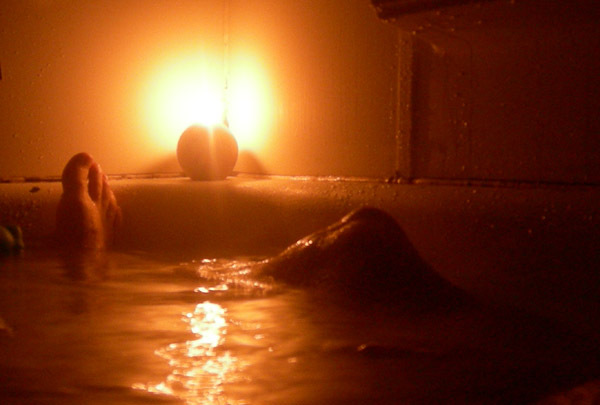 This makes me want to take a much needed relaxing bath.